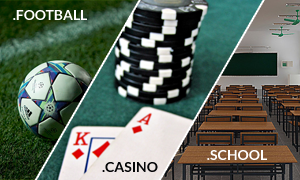 Three other new generic TLDs – .SCHOOL, .FOOTBALL and .CASINO – have entered General Availability phase and after day one gained over 1400 registrations each. These numbers also include registrations from Sunrise and Landrush period. Currently, the .SCHOOL extension has more than 2,800 registrations, .FOOTBALL is with over 2,200 registrations, and .Casino can boast approximately 1,900 registered domain names. Anyone can now register a domain name under any of the above domain extensions. Please use our search tool to find the domain name that best fits your needs. Please do not hesitate to contact us for assistance at support@web-solutions.eu.